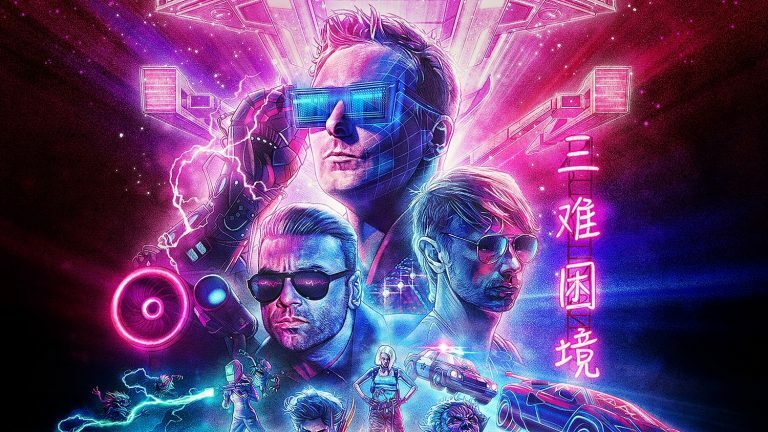 Equipped with an eye-popping 80s aesthetic, anxious political commentaries and thought-provoking science-fiction concepts, comes the return of the British trio Muse with their eighth studio album: Simulation Theory. Proceeding the heavy and aggressive sonic experience of 2015’s Drones, Matthew Bellamy and co. have emerged with an eager sense of ambition in the wake of the disheartening chore to “Make America Great Again”. Bellamy stresses the concerns of modern politics both home and afar with the sleek and bluesy ‘Propoganda’, confidently alluding to recent events within the both the US and UK governments. Obviously, these themes come as no surprise to long-time listeners of Muse, though the relevance of the theme strikes a greater impact then before due to the current political climate. Yet, in the bleak and dark of the musical landscape that is Simulation Theory, there is hope, with a call to arms for those lost in the disparity of modern living in the lead single ‘Dig Down’, inciting listeners to seek a way through the chaos of a year in question. The opposing theme to Simulation Theory is the obstacle of reality and the concepts that define and defy it. The opening track ‘Algorithm’ dives right into the greater design of the album’s concept by inserting the protagonist within a simulation in which one is bargaining and begging to be freed. The concept follows through hand in hand with many of the political themes throughout the album, addressing the need and desire of society to break away from the monotony and devastation of reality. The effectiveness of combining these concepts together is effortless and demands the attention of an in-depth indulgence. Simulation Theory’s greatest presentation comes in ‘Something Human’, the audience is treated to a folktronia-ballad that resonates a beautiful array of textures, presenting what is familiar and what is a step forward. In the same context, Muse have composed what may very well be the closest they’ve come to divulging into Pop sensibilities, featuring the sweet and glistening vocals of Tove Lo in the desperate Power-Ballad ‘Get Up And Fight’. Muse’s latest effort evokes a mix of what long-time devotee’s might come to expect from the three-piece rock band. While Simulation Theory may not quite push the envelope for the causal listener, it’s not to say that it isn’t an exhilarating listen at the same time. The song-writing employs very similar formulas to prior works and may bore those seeking a drastically fresh approach so deep into this band’s career. However, Muse still manage to provide a gritty and hard-hitting, electronic-infused rock album that 2018 needs, with catchy singles and a relevant commentary on the modern day.